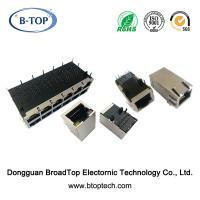 Home Companies Dongguan BroadTop Electronic Technology Co., Ltd.
Meet or exceeds IEEE802.3 standard. B50S(28-40)PF6-258A-P223-B52 1x1 100M PF6-258A G/Y Yes 6u"
B50(29-06)FP4-198-P613-B52 1x1 100M FP4-198 GO/Y No 6u"
B50(150-07)GP8-15-P622-F52 1x1 Gigabit GP8-15 GO/Y Yes 6u"
B50(150-53)GP12-106-P623-F12 1x1 Gigabit GP12-106 GO/Y Yes 6u"
B50(150-58)GP8-15-P623-F12 1x1 Gigabit GP8-15 GY/G Yes 6u"
B50(150-68)GP8-15C-P023-F52 1x1 Gigabit GP8-15C None Yes 6u"
B50(150-85)GP8-15A-P113-F52 1x1 Gigabit GP8-15A Y/G No 6u"
B50(150-88)GP8-15-P623-F52 1x1 Gigabit GP8-15 GY/GY Yes 6u"
B50(150-90)GP8-218-P023-B52 1x1 Gigabit GP8-218 None Yes 6u"
B50(151-02)FP4-150-P622-F12 1x1 100M FP4-150 G/GO Yes 6u"
B50(151-03)FP4-150-P623-F12 1x1 100M FP4-150 GO/GO Yes 6u"
B50(27-11)FP4-151-A623-B52 1x1 100M FP4-151 GO/Y Yes 6u"
B50(27-51)FP4-151-A613-B52 1x1 100M FP4-151 GO/Y No 6u"
B50(27-97)PF4-235-A223-B52 1x1 100M PF4-235 G/Y Yes 6u"
B50(27-100)PF4-244-A115-B52 1x1 100M PF4-244 Y/G No 30u"
B50(27-117)PF6-96-A223-B52 1x1 100M PF6-96 G/Y Yes 6u"
B50(27-118)PF4-260-A223-B52 1x1 100M PF4-260 G/Y Yes 6u"
B50(27-121)FP4-235-A223-B52 1x1 100M FP4-235 G/Y Yes 6u"
B50(27-122)PF4-269-A123-B52 1x1 100M PF4-269 Y/G Yes 6u"
B50(27-128)PF4-182-A213-B52 1x1 100M PF4-182 G/Y No 6u"
B50(27-137)PF4-153-A123-B52 1x1 100M PF4-153 Y/G Yes 6u"
B50(27-138)PF4-153-A123-B52 1x1 100M PF4-153 Y/G Yes 6u"
B50(27-142)PF4-269-A223-B52 1x1 100M PF4-269 G/Y Yes 6u"
B50(29-41)FP4-269-A023-B52 1x1 100M FP4-269 None Yes 6u"
B50(88-08)PF4-151-B023-B12 1x2 100M PF4-151 None Yes 6u"
B50(88-12)PF4-151B-B223-B12 1x2 100M PF4-151B G/Y Yes 6u"
B50(88-15)PF4-222-B323-B12 1x2 100M PF4-222 G/G Yes 6u"
B50(88-16)PF4-222A-B323-B12 1x2 100M PF4-222A G/G Yes 6u"
B50(511-21)PF6-96-A313-B52 1x1 100M PF6-96 G/G No 6u"
B50(511-32)PF6-96-A213-B52 1x1 100M PF6-96 G/Y No 6u"
B50(512-12)FP4-252-A013-B52 1x1 100M FP4-252 None No 6u"
B50(512-18)PF4-196A-A013-B92 1x1 100M PF4-196A None No 6u"
B50(650-11)FP4-178-A112-B12 1x1 100M FP4-178 Y/G No 6u"
B50(650-27)PF4-198-A612-B12 1x1 100M PF4-198 GO/Y No 6u"
B50(650-42)PF4-207-A113-B12 1x1 100M PF4-207 Y/G No 6u"
B50(650-53)G8-140A-A113-B12 1x1 Gigabit G8-140A Y/G No 6u"
B50(650-61)PF4-151-A113-B12 1x1 100M PF4-151 Y/G No 6u"
B50(650-63)PF4-207-A113-B12 1x1 100M PF4-207 Y/G No 6u"
B50(650-103)FT4-180-A215-B12 1x1 100M FT4-180 G/Y No 30u"
B50(660-09)PF4-147-A013-B12 1x1 100M PF4-147 None No 6u"
B59(57-50)FP4-236-1122-C12 2x1 100M FP4-236 Y/G Yes 6u"
B59(57-51)FP4-183-1323-C12 2x1 100M FP4-183 G/G Yes 6u"
B59(57-57)FP4-248-1223-C12 2x1 100M FP4-248 G/Y Yes 6u"
B59(311-32)FP4-162-2123-C12 2x2 100M FP4-162 Y/G Yes 6u"
B59(311-38)FP4-182-2223-C12 2x2 100M FP4-182 G/Y Yes 6u"
B59(315-51)PF4-162-2023-C12 2x2 100M PF4-162 None Yes 6u"
B59(117-09)FP4-203-4022-C12 2x4 100M FP4-203 None Yes 6u"
B59(117-11)FP4-162-4026-C12 2x4 100M FP4-162 None Yes 50u"
B59(119-01)FP4-237-4125-C12 2x4 100M FP4-237 Y/G Yes 30u"
B59(119-02)FP4-238-4125-C12 2x4 100M FP4-238 Y/G Yes 30u"
B59(119-03)FP4-242-4123-C12 2x4 100M FP4-242 Y/G Yes 6u"
B59(119-05)FP4-242A-4125-C12 2x4 100M FP4-242A Y/G Yes 30u"
B59(119-06)FP4-283-4123-C12 2x4 100M FP4-283 Y/G Yes 6u"
B59(123-13)FP4-162-4222-C12 2x4 100M FP4-162 G/Y Yes 6u"
B59(123-26)PF4-178-4623-C12 2x4 100M PF4-178 YG/YG Yes 6u"
B59(123-33)PF4-236B-4125-C92 2x4 100M PF4-236B Y/G Yes 30u"
B59(123-34)FP4-241-4223-C12 2x4 100M FP4-241 G/Y Yes 6u"
B59(123-40)PF4-162-4223-C92 2x4 100M PF4-162 G/Y Yes 6u"
B59(123-43)PF4-178-4223-C12 2x4 100M PF4-178 G/Y Yes 6u"
B59(123-44)FP4-162-4323-C12 2x4 100M FP4-162 G/G Yes 6u"
B60(115-19)PF6-230-4023-C12 2x4 100M PF6-230 None Yes 6u"
B59(175-05)FP4-162-6022-C12 2x6 100M FP4-162 None Yes 6u"
B59(176-02)FP4-162-6722-C12 2x6 100M FP4-162 G/Y Yes 6u"
B59(176-05)FP4-162-6323-C12 2x6 100M FP4-162 G/G Yes 6u"
B59(46-01)GP8-99-1623-C12 2x1 Gigabit GP8-99 GY/GY Yes 6u"
B59(46-11)GP8-19-1123-C12 2x1 Gigabit GP8-19 Y/G Yes 6u"
B59(46-12)GP8-19-1623-C12 2x1 Gigabit GP8-19 GO/GO Yes 6u"
B59(46-15)GP8-19-1023-C12 2x1 Gigabit GP8-19 None Yes 6u"
B59(46-17)GP8-19B-1623-C12 2x1 Gigabit GP8-19B GY/GY Yes 6u"
B59(46-18)GP8-19B-1613-C12 2x1 Gigabit GP8-19B GY/GY No 6u"
B59(46-22)GP8-19H-1613-C12 2x1 Gigabit GP8-19H GY/GY No 6u"
B59(46-23)GP8-19B-1613-C12 2x1 Gigabit GP8-19B GY/GY No 6u"
B59(46-25)GP8-141-1613-C12 2x1 Gigabit GP8-141 GY/GY No 6u"
B59(46-29)GP8-19D-1113-C12 2x1 Gigabit GP8-19D Y/G No 6u"
B59(46-31)GP8-67-1113-C12 2x1 Gigabit GP8-67 Y/G No 6u"
B59(318-03)GP8-19-2623-C12 2x2 Gigabit GP8-19 GY/GY Yes 6u"
B59(318-05)GP8-109A-2623-C12 2x2 Gigabit GP8-109A GY/GY Yes 6u"
B59(318-07)GP8-19A-2023-C12 2x2 Gigabit GP8-19A None Yes 6u"
B59(318-08)GP8-19B-2623-C12 2x2 Gigabit GP8-19B GY/GY Yes 6u"
B59(318-10)GP8-103B-2223-C12 2x2 Gigabit GP8-103B G/Y Yes 6u"
B59(318-16)GP8-19A-2123-C12 2x2 Gigabit GP8-19A Y/G Yes 6u"
B59(318-20)GP8-19B-2623-C12 2x2 Gigabit GP8-19B GO/GO Yes 6u"
B59(318-61)GP8-19B-2023-C12 2x2 Gigabit GP8-19B None Yes 6u"
B59(318-63)GP8-70-2023-C12 2x2 Gigabit GP8-70 None Yes 6u"
B59(318-64)GP8-70-2023-C92 2x2 Gigabit GP8-70 None Yes 6u"
B59(318-65)GP8-70B-2024-C92 2x2 Gigabit GP8-70B None Yes 15u"
B59(318-67)GP8-203-2023-C12 2x2 Gigabit GP8-203 None Yes 6u"
B59(112-32)GP8-220-4623-C12 2x4 Gigabit GP8-220 YG/YG Yes 6u"
B59(112-33)GP8-160-4223-C12 2x4 Gigabit GP8-160 G/Y Yes 6u"
B59(118-03)GP8-19A-4223-C12 2x4 Gigabit GP8-19A G/Y Yes 6u"
B59(118-05)GP8-19A-4023-C12 2x4 Gigabit GP8-19A None Yes 6u"
B59(118-11)GP8-103F-4023-C12 2x4 Gigabit GP8-103F None Yes 6u"
B59(118-15)GP8-103F-4623-C12 2x4 Gigabit GP8-103F YG/YG Yes 6u"
B59(118-43)GP8-139-4223-C12 2x4 Gigabit GP8-139 G/Y Yes 6u"
B59(118-49)GP8-109-4725-C12 2x4 Gigabit GP8-109 GO/GO Yes 30u"
B59(118-50)GP8-153-4625-C12 2x4 Gigabit GP8-153 GY/GY Yes 30u"
B59(118-53)GP8-19B-4725-C12 2x4 Gigabit GP8-19B GO/GO Yes 30u"
B59(118-55)GP8-19E(30W)-4624-C12 2x4 Gigabit GP8-19E OG/OG Yes 15u"
B59(118-56)GP8-19E-4623-C92 2x4 Gigabit GP8-19E OG/OG Yes 6u"
B59(118-57)GP8-19G-4725-C12 2x4 Gigabit GP8-19G GO/GO Yes 30u"
B59(118-58)GP8-19B-4623-C12 2x4 Gigabit GP8-19B GO/GO Yes 6u"
B59(118-59)GP8-109B-4725-C12 2x4 Gigabit GP8-109B GO/GO Yes 30u"
B59(118-67)GP8-161A-4323-C12 2x4 Gigabit GP8-161A G/G Yes 6u"
B59(118-71)GP8-161A-4224-C12 2x4 Gigabit GP8-161A G/Y Yes 15u"
B59(118-72)GP8-19G-4725-C12 2x4 Gigabit GP8-19G G/Y Yes 30u"
B59(118-74)GP8-103F-4223-C12 2x4 Gigabit GP8-103F G/Y Yes 6u"
B59(118-76)GP8-19J-4225-C12 2x4 Gigabit GP8-19J G/Y Yes 30u"
B59(118-77)GP8-19B-4223-C12 2x4 Gigabit GP8-19B G/Y Yes 6u"
B59(118-78)GP8-19B-4623-C12 2x4 Gigabit GP8-19B OG/OG Yes 6u"
B59(118-79)GP8-139A-4223-C12 2x4 Gigabit GP8-139A G/Y Yes 6u"
B59(118-82)GP8-139-4623-C12 2x4 Gigabit GP8-139 G/GO Yes 6u"
B59(118-83)GP8-19A-4623-C12 2x4 Gigabit GP8-19A G/GO Yes 6u"
B59(118-92)GP8-209-4723-C12 2x4 Gigabit GP8-209 GO/GO Yes 6u"
B59(118-95)GP8-67B-4123-C12 2x4 Gigabit GP8-67B Y/G Yes 6u"
B59(118-102)GP8-222-4126-C12 2x4 Gigabit GP8-222 Y/G Yes 50u"
B59(169-02)GP8-103F-6023-C12 2x6 Gigabit GP8-103F None Yes 6u"
B59(169-03)GP8-19A-6023-C12 2x6 Gigabit GP8-19 None Yes 6u"
B59(169-05)GP8-19A-6223-C12 2x6 Gigabit GP8-19A G/Y Yes 6u"
B59(169-06)GP8-115U-6023-C12 2x6 Gigabit GP8-115U None Yes 6u"
B59(169-08)GP8-103A-6023-C12 2x6 Gigabit GP8-103A None Yes 6u"
B59(169-10)GP8-19A-6123-C12 2x6 Gigabit GP8-19A Y/G Yes 6u"
B59(169-12)GP8-19-6023-C12 2x6 Gigabit GP8-19 None Yes 6u"
B59(169-21)GP8-149-6023-C12 2x6 Gigabit GP8-149 None Yes 6u"
B59(169-24)GP8-19K-6023-C12 2x6 Gigabit GP8-19K None Yes 6u"
B59(169-27)GP8-19B-6023-C12 2x6 Gigabit GP8-19B None Yes 6u"
B59(169-30)GP8-19D-6123-C12 2x6 Gigabit GP8-19D Y/G Yes 6u"
B59(169-31)GP8-139-6623-C12 2x6 Gigabit GP8-139 GY/GY Yes 6u"
B59(169-33)GP8-19D-6123-C12 2x6 Gigabit GP8-19D Y/G Yes 6u"
B59(169-35)GP8-19D-6623-C12 2x6 Gigabit GP8-19D GO/Y Yes 6u"
B59(169-61)GP8-103A-6623-C12 2x6 Gigabit GP8-103A GY/GY Yes 6u"
B59(169-64)GP8-109-6625-B92 2x6 Gigabit GP8-109 GO/GO Yes 30u"
B59(169-66)GP8-19B-6223-C12 2x6 Gigabit GP8-19B G/Y Yes 6u"
B59(169-79)GP8-103F-6123-C12 2x6 Gigabit GP8-103F Y/G Yes 6u"
B59(169-81)GP8-189-6223-C12 2x6 Gigabit GP8-189 G/Y Yes 6u"
B59(169-83)GP8-19B-6623-C12 2x6 Gigabit GP8-19B GO/GO Yes 6u"
B59(169-85)GP8-170A-6023-C12 2x6 Gigabit GP8-170A None Yes 6u"
B59(171-01)GP8-19A-6023-C12 2x6 Gigabit GP8-19A None Yes 6u"
B59(180-01)GP4-162A-6023-C12 2x6 Gigabit GP4-162A None Yes 6u"
B59(180-02)GP4-162A-6023-C12 2x6 Gigabit GP4-162A None Yes 6u"
B59(198-01)GP8-99-8623-C12 2x8 Gigabit GP8-99 GY/GY Yes 6u"
B59(199-02)GP8-19-8023-C12 2x8 Gigabit GP8-19 None Yes 6u"
B59(199-03)GP8-103E-8023-C12 2x8 Gigabit GP8-103E None Yes 6u"
B59(199-06)GP8-19-8123-C12 2x8 Gigabit GP8-19 Y/G Yes 6u"
B59(199-08)G8-56A-8023-C12 2x8 Gigabit G8-56A None Yes 6u"
B59(199-09)GP8-19B-8623-C12 2x8 Gigabit GP8-19B GY/GY Yes 6u"
B59(199-10)GP8-139-8223-C12 2x8 Gigabit GP8-139 G/Y Yes 6u"
Dongguan BroadTop Electronic Technology Co., Ltd. located in Dongguan Guangdong China, which is a professional and leading manufacturer of RJ45 connectors offering high quality products at a competitive price. The company established in 2012 which is a young company. We engaged in designing, manufacturing and marketing the connectors for Ethernet networking applications, main products including: Integrated (RJ45) Connector Module (ICM), RJ45 Jack without magnetics, RJ45 with USB and SFP Cage & Connector. We have obtained CE & RoHS certificates for our products, and we passed the audit for ISO9001:2008 standard certification in 2012, and we passed its renewal audit each year. Our quality mission is to provide products and services using established quality standards and to meet or exceed customer expectations. To fulfill this objective, we strive to produce components and assemblies that embody optimum levels of reliability and performance in their design, manufacture, and delivery.